Tay Ninh (VNA) - A burial service was held at the Hill 82 Cemetery in Tan Bien district, the southern province of Tay Ninh on July 26 to re-bury the remains of 344 Vietnamese volunteer soldiers who laid down their lives on Cambodian battle fields during wartime and seven martyrs found in the locality. At the ceremony, Chairman of the provincial People’s Committee Nguyen Thanh Ngoc noted that millions of volunteer soldiers and local people sacrificed their lives during the struggles against French and US aggression, as well as post 1975 wars to protect the country’s southwest and northern borders. The provincial authorities have joined hands with Cambodian localities in the search and repatriation of martyrs’ remains over the past number of years, he highlighted. During the 2015-2016 dry season, the soldiers remains were found by the K70 search team of Military Zone 7 and the K71 team from the Military Command of Tay Ninh province. Since 2000, local authorities and Military Zone 7 have retrieved 3,881 sets of martyrs’ remains through 15 phases of searching in Cambodia. 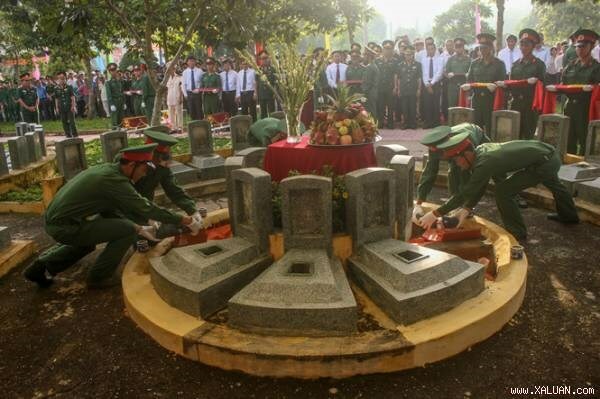 On the same day, a burial ceremony was also held in the southern province of Binh Phuoc to rebury 28 sets of remains of Vietnamese volunteers exhumed in Cambodia.